No matter what your level of expertise, it's often wise to "get back to basics" and review the rudimentary elements of this challenging, sometimes exasperating, bit of mental stimulus known as horse racing handicapping. Horse racing handicappers approach the process differently but these elements should always be addressed before making a wager. They are offered in order of importance to the overall equation. FORM: Nothing else really matters if a horse is not in "form" and the first task in attacking a race is to eliminate those runners that don't appear to be fit from a condition standpoint, either through recent racing or with a string of workouts that suggest the animal is set to do its best work. A competitive recent race (accompanied by the necessary a.m. maintenance if it's last race was more than two weeks ago) is the most reliable indicator for fitness. Horses that haven't raced in 30+ days should either offer ample workout evidence that they are doing well, have a history of performing well off short (or longer) breaks and come from barns that regularly win races. The group that doesn't fit into this rather wide parameter should be eliminated from further consideration, allowing the handicapper to concentrate on the true contenders. It doesn't matter what a horse has done in the past if it doesn't look capable of running well today. On the other hand, don't be quick to draw an "x" through potential longshots that come off bad lines if they had legitimate excuses like racing at an unsuitable distance, on an unsuitable surface, fought a strong track bias, is moving from a losing barn to a winning one or has been given a freshener followed by positive workout activity. This is the #1 element in successful horse racing handicapping. ABILITY: How fast can the remaining horses in the field run on their best day? That's the next question to be answered. There are many different ways to evaluate talent in this era of speed figures and performance ratings.. The task at hand is to determine two things: What is the horse capable of doing? ; and, what does it figure to do today? Those horses that do not figure within three lengths of the top contenders in the race can be eliminated. CLASS: This is a tricky part of the puzzle since horses can improve and regress quickly in this day-and-age of year-round racing when trainers try and squeeze races out of horses that obviously need a rest and the track veterinarians help them do it with an array of legal medications. Often, outclassed horses will be eliminated in Step #2 but in the case of horses stepping up in class off impressive efforts, it's necessary to analyze how those figs were earned. Horses that benefitted from easy pace pictures, strong bias situations or simply raced against a bad bunch of rivals, should be viewed with skepticism when trying to step up to a tougher level. The best class jumpers to play are those that tailed off, dropped in class and are now moving back up while appearing to have regained their form. "Past Class" is a big horse racing handicapping plus and is often overlooked by many players. RACE CONDITIONS: Does the horse like today's surface and today's distance? Even horses that are in form and have the ability and the class to win are generally beaten when entered in unsuitable races. Some horses move easily between sprints and routes or from dirt to turf while others do not. Before leaving a contender in the mix any longer, be relatively certain in your mind that he'll handle today's conditions. CONNECTIONS: The human part of the equation is substantial. True, a great rider and an accomplished trainer can't win on a bad horse but by this stage you should have eliminated the "bad" ones. However, "good" horses can be beaten by a jock's poor decision or by a trainer who has a hard time cinching up a saddle correctly. Let the record guide you in this area. Eliminate horse's trained or ridden by traditionally low-percentage stables or jocks and take a long, hard look at short-priced types that are trained or saddled by individuals mired in ongoing slumps. Just as professional athletes in all sports go into slumps, so do trainers and riders. The more they lose, the more they think and the more they think, the more they lose. That's just the way it is. Many horse racing handicappers underestimate this to their peril. BREEDING: Pedigree analysis is only significant when analyzing a horse that has not had ample (or no) opportunity to show what it can do under today's conditions. First-time-starters bred for sprint speed vs. those bred to run best going longer. Sprinters trying to go long. Dirt types moving to turf. The only time you should concern yourself with breeding is when a potential contender has survived the first five steps of this procedure. When playing a horse 'on the come', always get good value and be willing to bet against (or pass the race) when the favorites are not proven under today's conditions, even if their pedigree says they should handle the situation. Just because they're bred to do it, doesn't mean they WILL DO IT, first or second time around anyway. After completing these six steps you should have eliminated the pretenders and whittled the field down to the contenders. The more contentious a race looks on paper, the more 'value' you should demand. It makes no sense to back the favorite in a ten-horse field where it looks like five other horses can also win. Make some kind of odds line so that you have an idea of which horses are true overlays in your own mind. It's no secret that handicapping horses is a time consuming process. 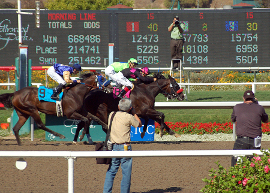 You have to watch the races, put in the research and perform in-depth analysis to increase your odds at the track. I spend hours researching my picks, I have a proprietary predictive modeling technique and other strategies that help improve odds of winning. Save time with my free horse racing picks or purchase packages for all the major races right on the site.